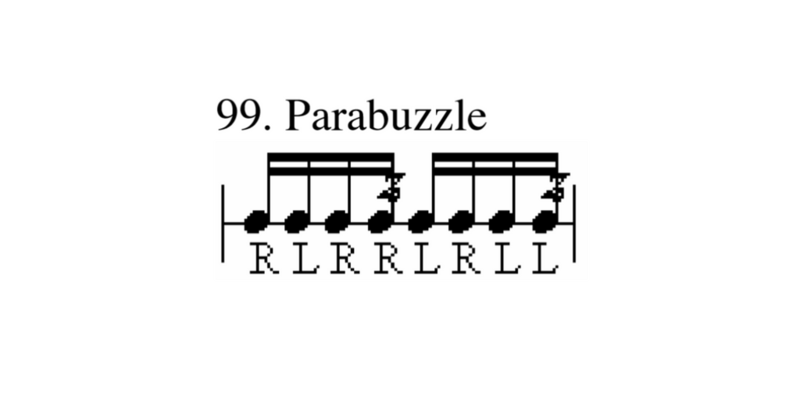 The parabuzzle is a simple single Paradiddle pattern with a buzz added to the last note on each. The approach seems simple but at faster tempos we see that there in more emphasis placed on our technique. The “buzz” at the end of each single Paradiddle deals with the amount of fulcrum pressure applied and released. Too little pressure and we get multiple bounce so try to dig in to the head/practice pad to get the right feel and sound. We want a clean “buzz”, not a double, or diddle. With that being said we also want that buzz to happen quickly and get out of the way so that we can jump back into the pattern playing medium to loose.